The daredevil flying style of Autobot Whirl might make it look like he could crash at any moment, but he's in total control. The mere sight of him over the battlefield is enough to send enemies running for cover, trying to reach a safe distance before he crashes. Any Decepticons unlucky enough to stick around give him a chance to take his Null-Ray Cannon out for a spin. This toy is a weird one. 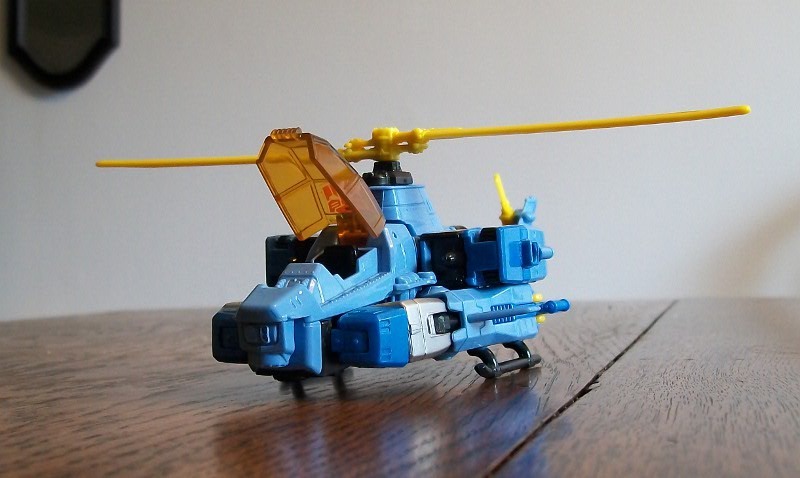 Whirl, for those of you who are not familiar, was originally released in 1985 as a repaint of a helicopter from the Dorvack line. Notable for being a gangling one-eyed bugger who basically didn't look like he belonged with any other Transformer, his only fictional appearances consisted of showing up as part of the Wreckers a few times and serving as cannon fodder and/or standing around in the background while the cooler characters did something important. 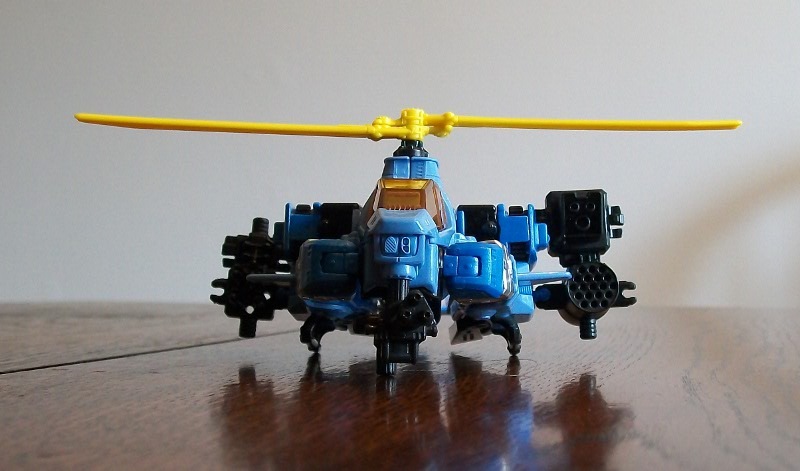 Hasbro did continue to produce Whirl toys after that, but his status was firmly cemented as "what we call helicopters when we don't want to use Springer or Blades". 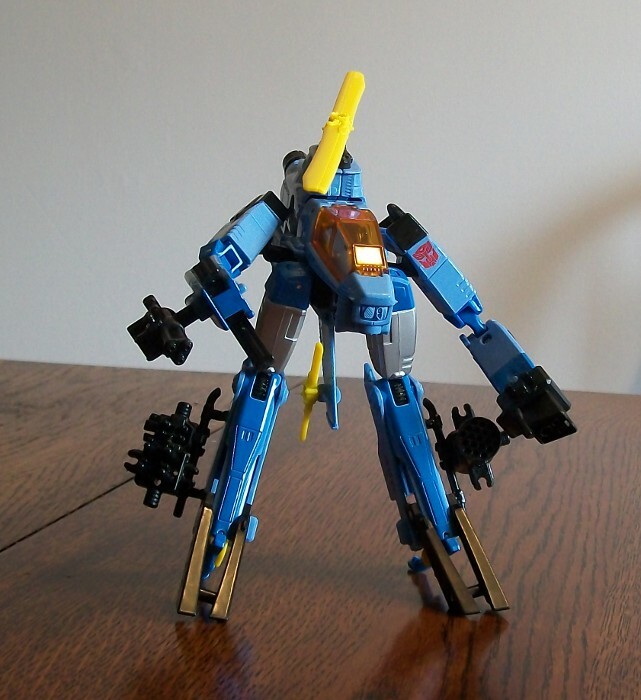 And while I and one or two others loved Whirl solely because of how fun he was in the Archive's old RPG, to the majority of the fandom he was basically as important as Road Hugger or Turbofire -- which is to say not at all. But then a funny thing happened -- in 2012, fan-turned-writer James Roberts was given the reins on IDW's new More than Meets the Eye series and was either allowed or asked to choose a lead cast made up of less-known characters. Among his collection of lovable rogues, violent head-cases and neurotic losers was none other than the subject of our review, characterized as a loon too dangerous and crazy even for the Wreckers. But IDW Whirl is very different from the original, sporting a design that doesn't resemble the original awkward collection of boxes at all. So naturally, with the toy being obviously inspired by the new comic version of Whirl you'd expect it to resemble that design, especially with so many IDW-inspired designs showing up in the Generations line. But it's not. It has a few nods to that design -- most notably, digitigrade legs and a head that's lifted straight from the comics. But for the most part it's an homage to the original toy, with boxy limbs, lots of accessories and a fairly gawky look overall. This has inspired no end of fandom angst, though it made me quite happy because I like the original Whirl a ton more than the IDW design. That's beside the point, though. Whatever reasons Hasbro had for taking the design in the direction they did, the did make it this way, and this review is going to talk about the toy we actually got instead of focusing on what might -- some would say should -- have been. One other thing to note: Whirl comes with stickers. That was very common back in the 80s but hasn't happened with any regularity for a couple decades. The designers have said it was an added layer of homage to the original, though I think it's more likely an attempt to mollify those among the fandom who are annoyed by how many fewer paint applications the toys have these days. If it is intended as a compromise solution, I don't think it's one that makes many people happy. For my part I've applied the faction symbols and ignored all the rest, and don't really notice that anything is missing. 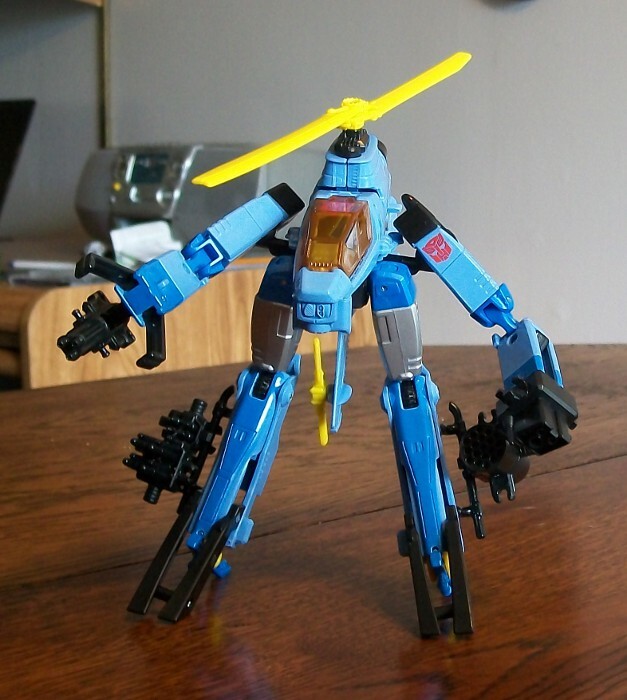 Alternate Mode: Whirl, like his 80s namesake, is a blue helicopter. But unlike the original, which was light blue all over, this one is two-toned. He's still a majority light blue, but he has several details in a darker hue that break up the monotony of the original scheme. His cockpit is orange, part of his fuselage is silver, his rotors are yellow and he's got a big red stripe on his tail, all of which serve to nicely break up the blue colour scheme. Smaller black details are visible over all of his body, as well. His arrangement is very similar to the original, but that's not necessarily a compliment. His arms and legs fold up rather conspicuously against his fuselage, and while they do a decent job of blending in if you've got his accessories attached, they're still pretty hard to ignore. It's not terrible the way Waspinator is, but it's definitely a minus, and an area I wish they'd improved on over the 80s toy. As it stands the only place where the design is smoother is the helicopter's skids, which are far smaller and less obtrusive than the original. The accessories, however, really do make the alt-mode. Though the Transformers line has suffered from a lack of accessories for a decade or more now, Whirl happily avoids that trope. He comes with four different weapons, three of which are designed to very closely match the incendiary shell cannon, null ray module and photon rifle that came with the original (he has apparently traded in his paralyzo-box for another missile pod). They can be clipped onto his legs and arms the sides of his fuselage and his landing skids, or pegged in under his cockpit with 5mm pegs. With so many different weapons there are a huge number of combinations possible, which makes the alt-mode a lot more fun than the simple, fairly boring helicopter he seemed at first glance. The toy's spinning rotors and opening cockpit are an added bonus, and all in all he's a pretty nifty vehicle. Intermediate Mode: Earlier I mentioned that Whirl's vehicle mode didn't improve on most of the transformation compromises that the original had sported. This "mode", if you want to call it that, is why. It's basically a half-way step between robot and vehicle, capitalizing on the fandom's desire to create "gerwalk" modes for all sorts of toys that don't really need them. Not only is it wholly unnecessary and not reflective of the source material, it also absorbed some of the engineering budget a big chunk of under-cockpit real estate that could have been used to make the two actually important modes better. Like the helicopter, the "helopod" mode is mostly light blue with dark blue, yellow, silver, orange and red highlights. But the whole thing looks fairly ridiculous. An awkward set of arms and legs awkwardly bolted onto the fuselage of a helicopter, it's really not the sort of thing I'm liable to ever go back to once I've taken pictures for this review. On the other hand, it does have the same level of articulation as his robot mode (which we'll talk about in a bit), so if this sort of third mode is your thing it's perfectly serviceable. Robot Mode: Finally we reach the mode that launched a thousand fandom rants! 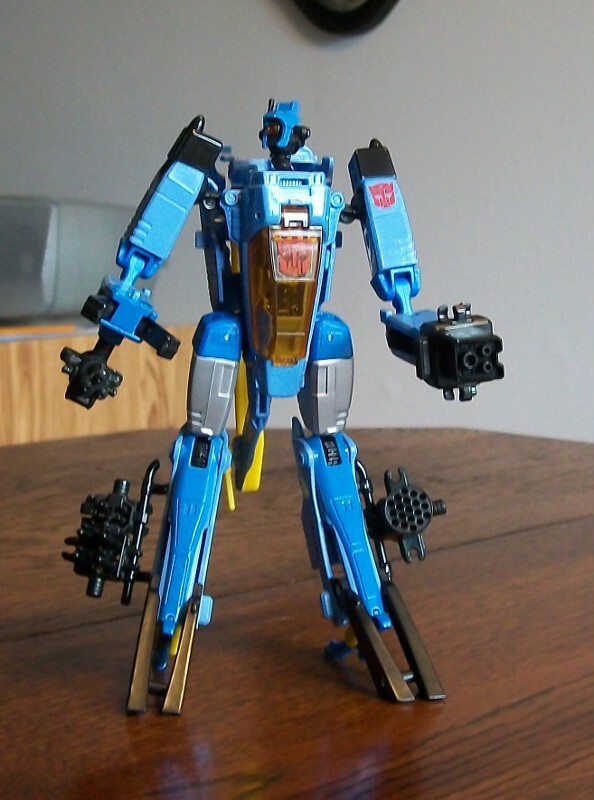 Whirl's colours haven't changed substantially from the previous two modes, so he's still primarily light blue, with dark blue, black, silver and orange bits. The yellow rotors and red tail, however, are mostly hidden unless you view him from the back. And like the helicopter, the addition of more colour (extra dark blue in particular) serves to make this Whirl much more eye-catching than the original. Unlike the slightly sloppy helicopter and the ungainly third mode, Whirl's robot form is very slick. The designers managed to maintain the boxy look of the original, but still give the figure a more dynamic, agile feel, a big improvement from what looked like a hastily bolted-together 70s sci-fi robot. His legs are the biggest departure from the original -- in addition to the reversed knees, he features a weird three-toed splayed stance instead of the gigantic skis that the original had. 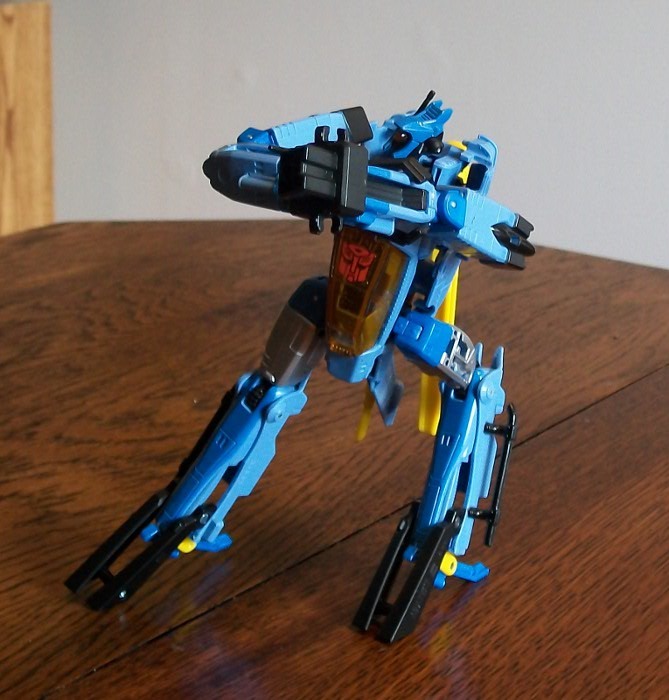 And as distinctive and nostalgia-inducing the ski-feet may be, the new legs were a good call: no matter what pose you put him in the new Whirl looks like he's ready to pounce. And as another bonus, the robot has very little kibble. The little that he does have folds into a compact backpack, leaving you with a minimalist robot that looks good from all angles. Whirl's head also deserves a mention. The original Whirl's head was a box with an eye and an antenna on it, looking like an old-timey security camera more than anything. The new toy's head is based pretty closely on his IDW design, a much less regular shape that makes him look very alien instead of just coming off as retro. 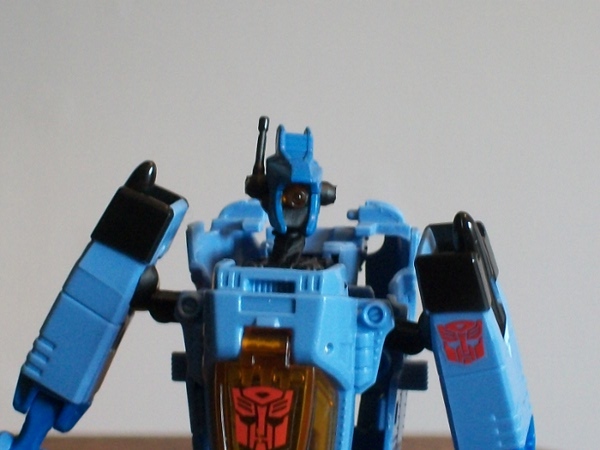 He's also got an articulated antenna, which can be used to either block off or expose the light-piping that brightens his single orange optic sensor. The figure is blessed with articulation as well, most of it far beyond the standard. Aside from the antenna-joint I just mentioned, Whirl's head is mounted on a ball joint that gives a good range of motion, allowing the toy to express emotion with a cocked head like he sometimes does in the comics. It also features an optional extending neck, giving owners a choice between having his head sit flush on his torso like the 80s figure or at the end of a slender, angled neck like the modern interpretation. He also has double-jointed shoulders, elbows and knees, universal-jointed hips, bicep and thigh swivels and even opening claws. The only things he's missing are a waist joint (not possible by dint of his transformation) and ankles, and the latter aren't especially vital since he's standing on tip-toes at all times anyway. 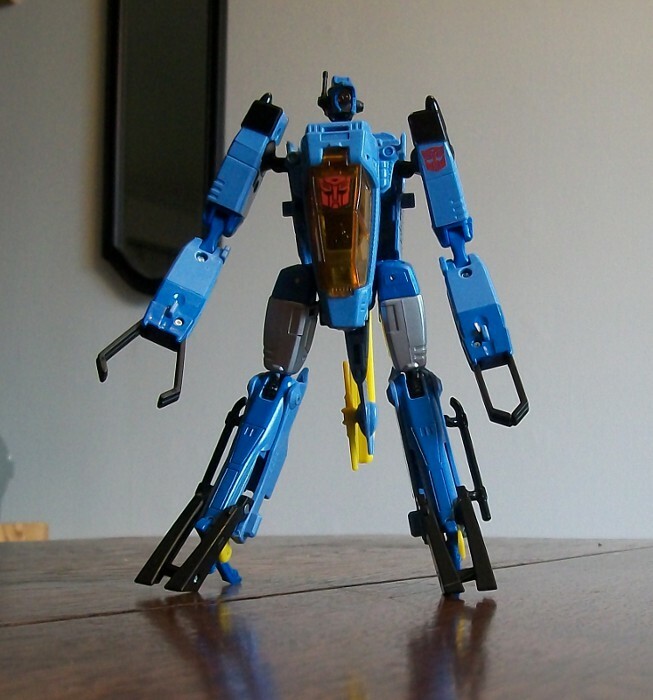 The lanky frame lends itself to a wide range of motion, making Whirl a highly poseable figure, and his wide footprint gives the toy great balance. The arms are especially fun: he can clasp his hands together, cross his arms over his chest in annoyance and generally bend his arms into most configurations you can think of. The legs take a bit of getting used to since they're jointed "backwards", but once you get the hang of them they offer just as much range. Unfortunately, as much as the articulation is an asset it's also the figure's greatest downfall. The upper joint of his double-knees is ludicrously tight, to the point of barely being able to move in many figures. And because the piece that connects the two knee joints is nothing but a small plastic spar, many fans have suffered broken toys when they apply the force necessary to get the joint to actually move. Mine was definitely afflicted by this, and it was a wet blanket on an otherwise really cool figure. It's easy to fix, thankfully. Five minutes, a file and a willingness to knock out pins from a joint are all I needed to set it right. But new toys shouldn't need fixing, and the majority of fans probably don't have the knowledge or willingness to perform surgery on their toys that I do. The ease of repair means that it's not a Blitzwing-scale QC failure, but the stress that the unmodified joint goes through definitely takes a big bite out of the toy's durability score. Like in his other modes, Whirl can use all four of his weapons as a robot. The null ray is a handgun of sorts, able to slide onto his wrist over top of his folded-up claws. The rest of his weapons can be mounted on his assortment of 5mm holes and 3mm rails, though in this case I feel that less is more. It's nice that we have the option of using all the weapons, but with anything other than the null ray Whirl starts to look cluttered, detracting from the figure's slick design. In spite of the QC issues, Whirl really is a great figure. Aside from the woeful Blitzwing I've been quite impressed by all the Generations Voyagers I've bought, and Whirl is no exception to that. He definitely deserves to be ranked alongside the highly popular Springer or Rhinox.